We love making and eating tin foil dinners! These easy-to-prepare meals are perfect for the first or second night at camp. Do the prep work at home, and you have a delicious meal just waiting to be cooked. Once you know the basics, you can get creative with the ingredients. The possibilities are endless! Why make tin foil dinners? 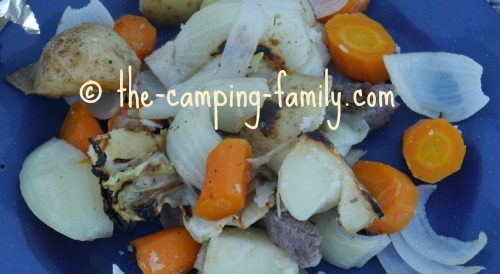 There's something about cooking over a campfire that turns just about any food into a feast. All of the prep work can be done at home. Make up the packets the night before you leave, pop them in the cooler in the morning, and your first night's meal is taken care of! If you build a campfire as soon as you arrive, it can be burning down to coals while you set up the tent or RV and get your campsite organized. That means that there are no pots to wash! 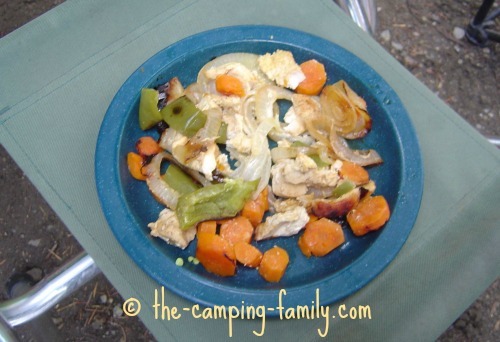 Cooking with a campfire is fun! A meal that would be just ordinary if cooked on a stove becomes exciting when cooked right in the fire. Make a separate foil packet for each person. You can adjust the ingredients for individual food sensitivities and preferences. Better yet, have each person make his or her own packet! Spread out a a piece of foil. Place the ingredients in the middle of the foil. Continue adding ingredients in layers. 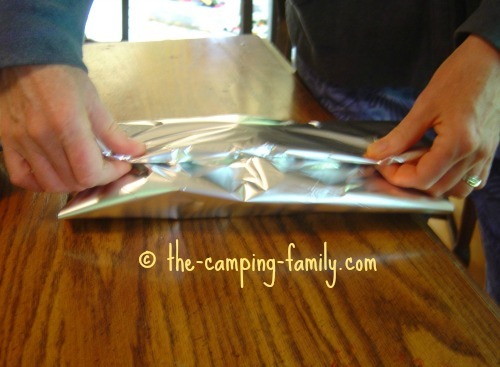 Take the edges of the foil and draw them upwards. 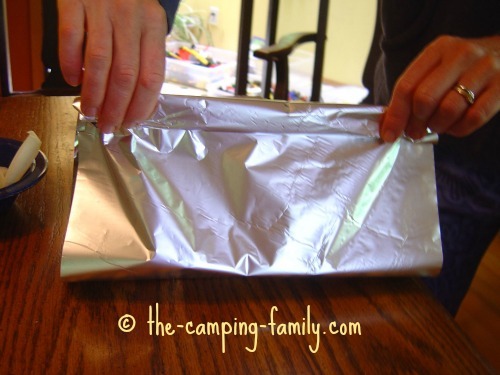 Fold the foil down to make a packet. Seal the edges of the foil securely. 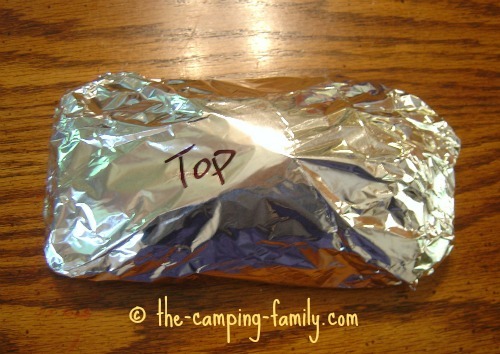 Wrap the packet in another layer of foil. Seal the edges and label the top. Place the packet in the fridge. When you're ready to pack, put the packet in the RV fridge or in the coldest part of your cooler. Build a campfire and let it burn down to coals. Place the foil dinners on the coals. Periodically take a packet out of the fire using oven mitts or heat resistant gloves. These extra-long campfire gloves get excellent reviews at Amazon. Open the packet carefully, and check for doneness. What goes into a foil dinner? 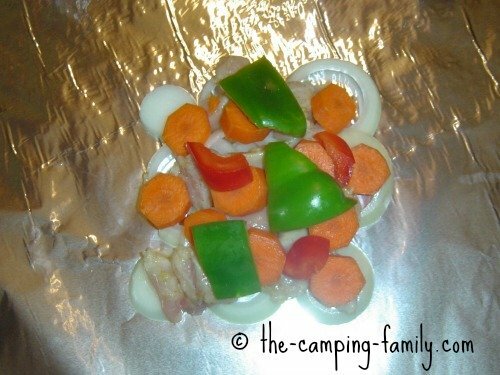 You can put just about any combination of meats and vegetables into a foil dinners, but some work better than others. Any type of meat works in a foil dinner - but you must ensure that it is cooked thoroughly. If you're just learning about making tin foil dinners, why not used precooked meat? Then you won't need to worry about whether the meat is cooked. When the meat is warm and the vegetables are tender, supper is ready! Choose vegetables that will hold their shape and not get mushy. These vegetables work especially well in a foil dinner - but feel free to experiment with your favorites. Put the onions on the bottom of the packet. Unlike most other foods, onions taste great even if they get a little bit burnt. Use a marinade - or oil the foil. If you are using raw meat, marinate it before adding it to the packet. Marinating adds flavor, and also keeps the food from sticking to the foil. If you are not using a marinade, oil or butter the foil before adding the ingredients. Those packets are hot!! Use oven mitts or heat-resistant gloves when handling tin foil dinners, and let them cool a bit before opening them. Watch out for escaping steam. Use a long-handled spade for moving the packets. 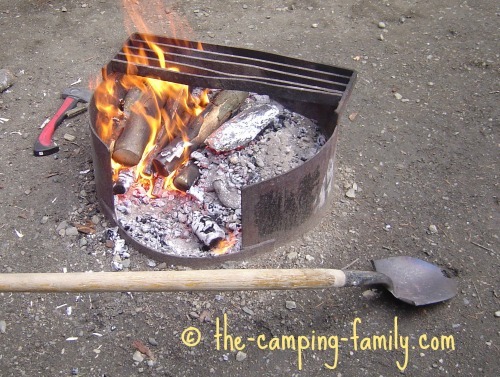 A long-handled spade is the perfect tool for campfire cooking! It allows you to move coals around, place foil dinners in the coals, and remove them - all without getting too close to the heat of the fire! You don't want ashes in your food! 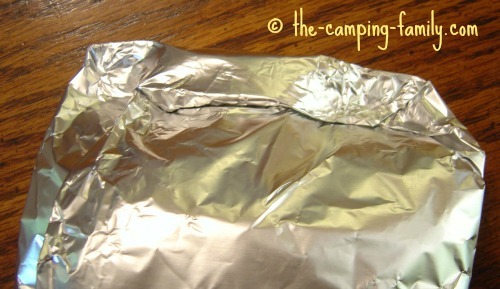 Open the outer piece of foil carefully and discard it. Shake any ashes off the inner packet before opening it. Be prepared for dirty fingers. Your fingers will get dirty when you open the foil packets. Have soap and water handy - or use homemade baby wipes for a quick and easy cleanup. If there is uncooked meat or poultry in your packet, put the packet in a plastic bag to prevent juices from leaking. Then put ice in the plastic bag before you put it in your cooler or RV fridge. Keep the packets scrupulously cold until you are ready to cook. 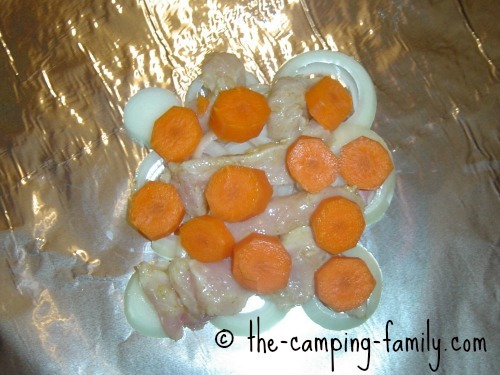 Plan to cook packets with raw meat or poultry on the first camping day. 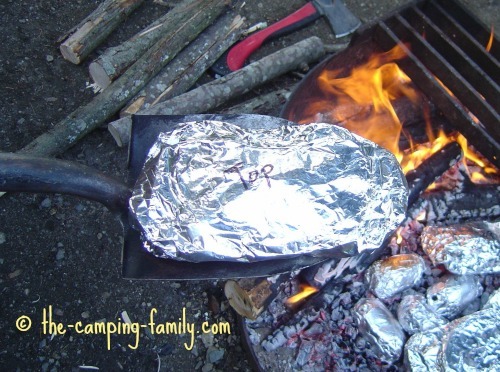 Click here for more campfire cooking tips. This page is a work in progress. I'll post more recipes as I try them. 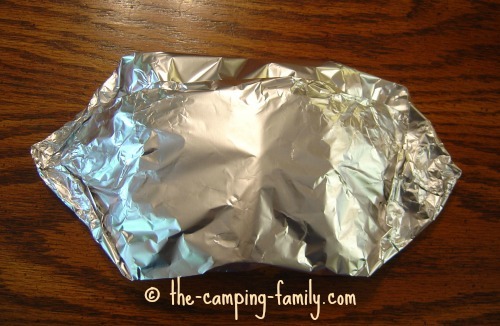 Do you have a favorite tin foil dinner? I'd love to hear about it! This is delicious and easy. Click here for full instructions. 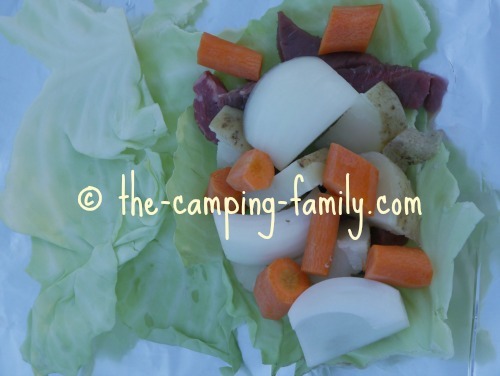 Wrapping a foil dinner in cabbage leaves keeps the important ingredients from getting burnt! 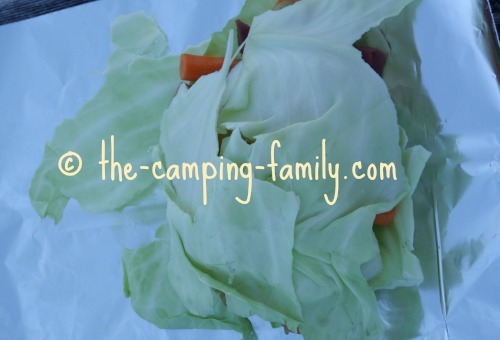 Lay another cabbage leaf on top, and wrap in foil as described above. Cook as you would any tin foil dinner. You can eat the cabbage leaves or not, as you choose. Do you have a foil dinner recipe to share? What's your favorite foil dinner? You can give exact quantities and instructions if you like, or just list the ingredients you use. 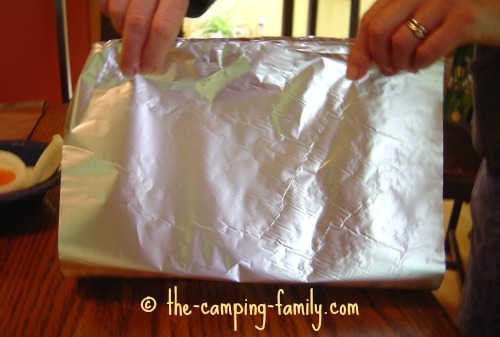 Do you have a photo of your foil dinner - or of your family enjoying it? How about a photo of your campfire? 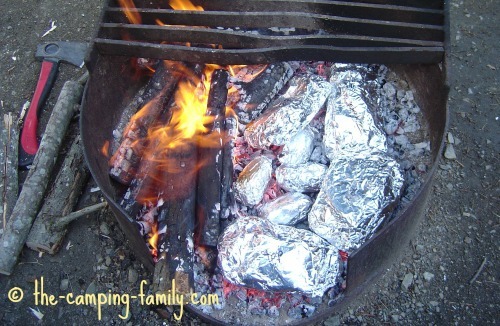 Now that you know how to make tin foil dinners, click here to find more great camping food ideas. Have you visited The Camping Family home page yet? It's a great starting point when planning a camping trip!